In celebration of Easter we’ve got an amazing deal just for you and your loved one! For the month of April we’re running a buy 1 get 1 free special! 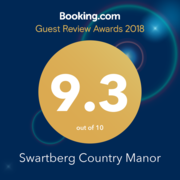 Book your stay for you and your darling during April at Swartberg Country Manor and only pay for one person and an extra breakfast for the next morning! Offer only valid for stays during April so hurry up and book now: 071 659 3830 | res@swartbergmanor.co.za.